Music can uplift, connect, and at times, even heal. Last night, we got to experience all three facets, working in unison, and it was a beautiful thing! 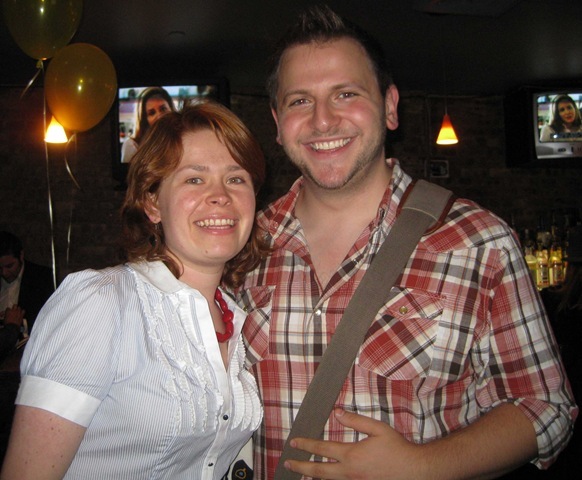 While we have attended a large number of shows over the past six years, it was only recently (April 2009 to be exact) that we noticed (and were happily pulled into) the incredibly vibrant indie music scene in NYC. It all began with The Paper Raincoat. Through them, we’ve heard about a number of other local artists, and visited venues we hadn’t been to before. Through ambeR Rubarth (one of the members of The Paper Raincoat) we met Alex Berger (at first, virtually, then in person, at a Paper Raincoat show at Rockwood Music Hall). We missed getting to see Alex in two consecutive shows. He told me he was playing at a Livestrong Fundraiser for a friend of his, Shannon Black, who is a cancer survivor, raising money for Livestrong, preparing to run in the NYC Marathon. It was such a great cause that we had no hesitation in committing to attend. First, before telling you about last night, click on Shannon’s name above, and find the link to donate to her fundraiser. You’ll feel a lot better about reading the rest of this post, and enjoying the show you missed, vicariously! There were 11 performers last night. Nine of them are listed on the page linked to Shannon’s name above (I’ll repeat them all here, but still, click on that page to donate!). With the exception of Alex doing a one-song encore, all but one of the other performers played two songs. I’m trying to get the order of the performers correct, but since I didn’t write anything down, apologies if I accidentally swap any of them. 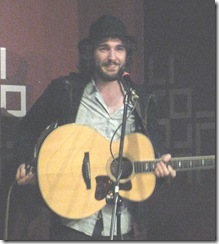 Alex Berger opened the show. 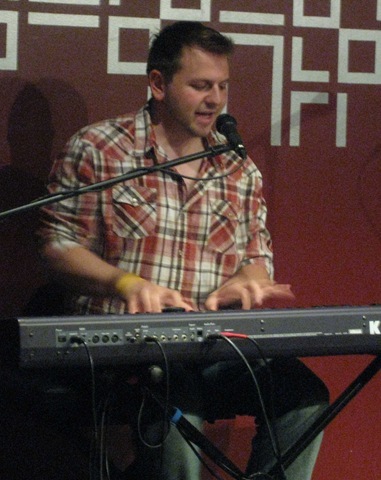 He sang and played the electric keyboards. Wow! 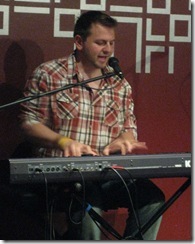 I’d be happy to just listen to Alex play the keyboards, he’s excellent! But, he also writes wonderful songs, and has a really good voice, so he’s the complete package, end to end. Shannon shamed him into adding one last song to close the show. Thanks Shannon, and thanks Alex, for that! 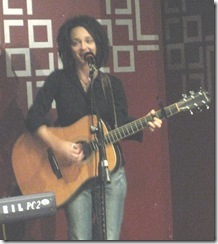 Libbie Schrader sang and played electric keyboards. She plays the keyboards very well, and has a very powerful voice. As Libbie described her style to us before the show started, she’s more of a Pop person (Rock/Pop really), so soloing in a small space with just keyboards, probably isn’t the best spot for her. She has a ton of talent, but probably better suited to a larger venue with more pieces in the band (which she usually has). 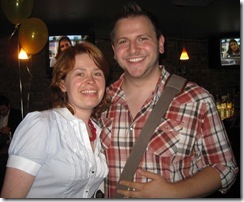 Lois didn’t get a good shot of Libbie on the stage, but she got a great one of Libbie and Alex before the show started! Deena Goodman and Dov Rosenblatt were on together. Deena sang and Dov played guitar and sang. 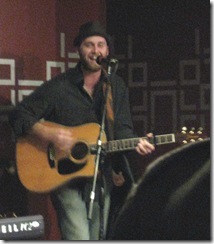 Both have exceptional voices, blending beautifully, and Dov is an excellent guitarist. The first song was co-written by them. 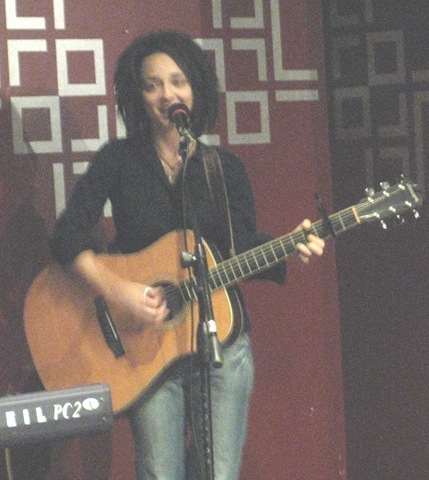 The second song was recently written by Dov (stunningly beautiful! ), and he taught the harmony to Deena right before the show started. Folks, while Deena stumbled once or twice (understandably), she really knocked the ball out of the park in terms of enhancing an already gorgeous song. Bravo! 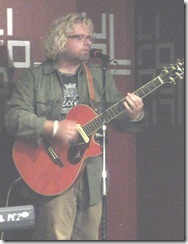 Will Knox sang and played guitar. Will’s guitar picking was superb. His voice and songs matched. Absolutely wonderful performance. He has quite a humble persona for someone with this much talent. Martin Rivas sang and played guitar. Alex introduced him as his personal favorite. I was impressed by Martin (Lois more so than me), but I’d need to listen to him a lot more to understand why Alex feels the way he does, even compared to a number of the other performers last night. Martin has a very strong voice, and perhaps I was distracted that the only time the sound guy (who donated the equipment and his time for the event!) didn’t get it perfect was on Martin’s voice, which was a little too loud. Amy has a Broadway style and quality voice. In fact, I would love to see her in Wicked! (We’re going again tomorrow night, 8th time, so if she could arrange to get into the cast by then, I’d appreciate it!) 😉 Kristin Chenoweth is one of our all-time favorite performers (song, stage, TV, comedy, everything!). The only disappointment was that Amy played only one song, though at least she played it to perfection! We have to start stalking Amy for future performances! 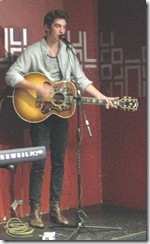 Kyle Patrick sang and played guitar. Kyle wasn’t listed on the Facebook page. 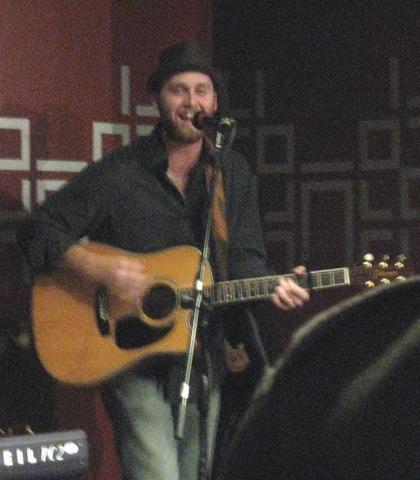 He is the lead singer for a group called The Click Five. Aside from making the girls swoon with his looks, Kyle is an incredible singer, and plays the guitar well too. After his first number, he said he was going to play a brand new one. It turns out that he played the new song from The Click Five, called I QUIT! I QUIT! I QUIT! Great song (both when he did it solo, and by the full group). In the middle of the song, Kyle popped a guitar string. He was a trooper, and just kept playing (he really didn’t miss a beat!). However, Martin Rivas was even faster. 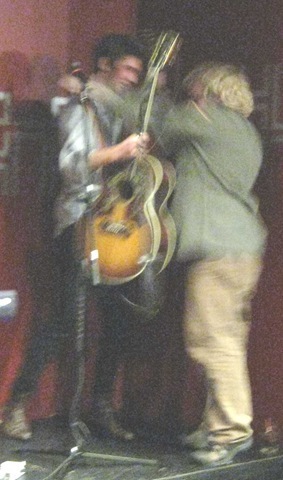 He dashed to the side of the stage, got his guitar out of his bag, and handed it to Kyle in a smooth motion (looping the strap over Kyle’s head as he handed him the guitar and took away Kyle’s!). It was great, and showed a lot of class on Martin’s part! 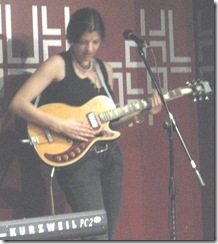 Shira Goldberg sang and played the electric guitar (all others were acoustic). Shira semi-joked that she was asked (as was everyone else) to play uplifting or happy songs, but that she hadn’t yet written any. 🙂 She sings beautifully, and plays the guitar quite well, but she really wasn’t kidding, her songs are deep bluesy numbers, slow, sad tales. Very talented, but perhaps not perfectly suited to last nights venue or cause. 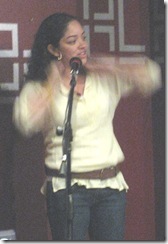 Lynette Belardo sang. Yes, sang, with zero accompaniment. That’s a very hard, and brave thing to do. Of course, if you have a voice like Lynette, you can pull it off, and she certainly did. Lovely. The first song was a spiritual (very appropriate for the evening). Obviously, a very talented woman, given that most of the credits I spotted on the Net were dancing related! 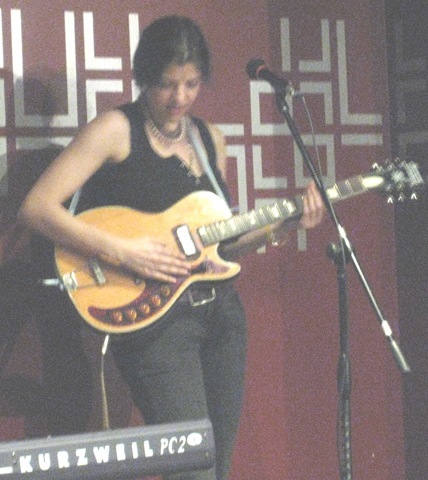 Michelle Citrin sang and played guitar. She was the other person who wasn’t listed on the Facebook page. Another amazing voice, accompanied by excellent guitar skills. The surprising thing is that she’s tiny, and yet, such a big powerful voice. She had the entire crowd (OK, not including me) belting out some Bob Marley verses with her on one of her numbers. Superb! I already mentioned that Alex closed the show. We immediately said goodnight and headed home (it was late for us old fogies). We had a wonderful night, discovered another slew of amazing local musicians, and supported a good cause, and some very inspirational people. Very grateful to have had the opportunity to be a small part of last night!